Sensory play is probably the simplest way to help children engage their senses is by playing outside with nature, full of colours, movement, textures, sounds and smells. 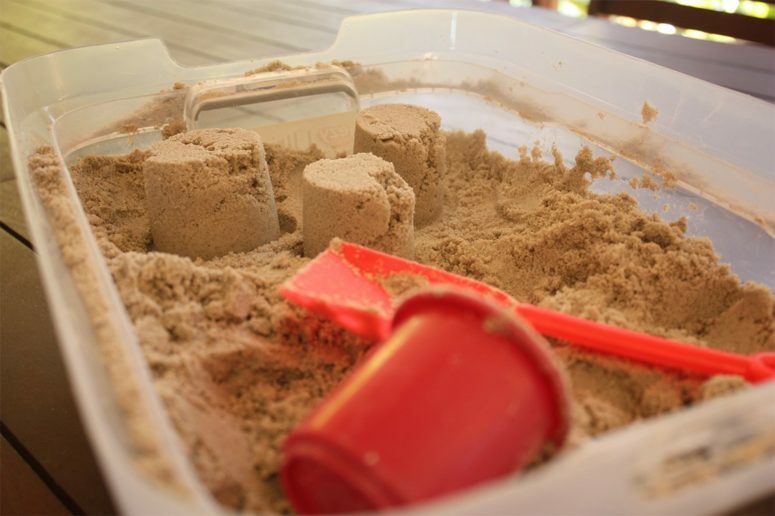 Summer is the best time to play outdoor for your kids, and small children love playing with sand – whether it’s beach sand or usual sand in a sandbox, it’s a great affordable type of sensory play. But sometimes it’s not possible to play outdoors or you don’t have a sandbox at hand, and then kinetic sand is your answer. 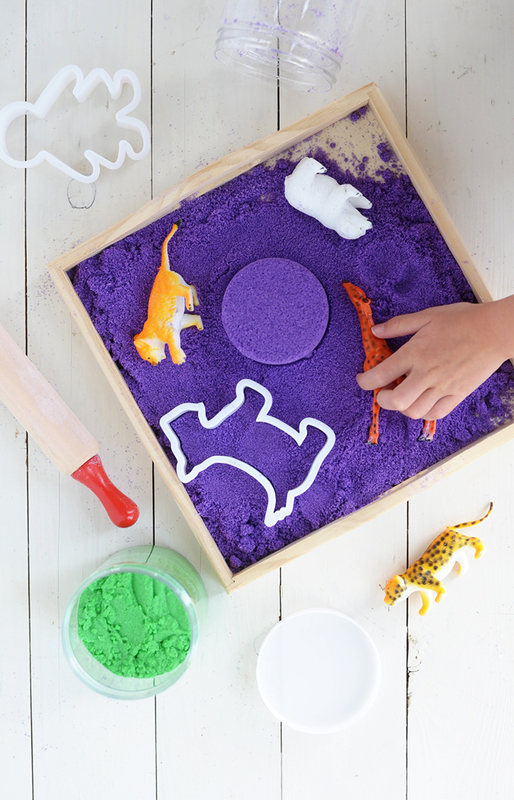 Kinetic sand is a toy that looks like regular sand, but is available in different colors. It mimics the physical properties of wet sand, and it can be molded and shaped into any desired specific form. It does not stick to other materials and surfaces, but rather only to itself and does not dry out. You can buy some or make yourself of some simple things that you may have at hand. Here are some recipes that you may like. This project will take just 10-20 minutes and such colorful kinetic sand makes great birthday gifts, stocking stuffers or party favors! You will only need a few ingredients to make this kid-approved project – colored play sand, corn starch, dish soap and water. Make party favors of it putting the sand into individual containers and adding cookie cutters to it. 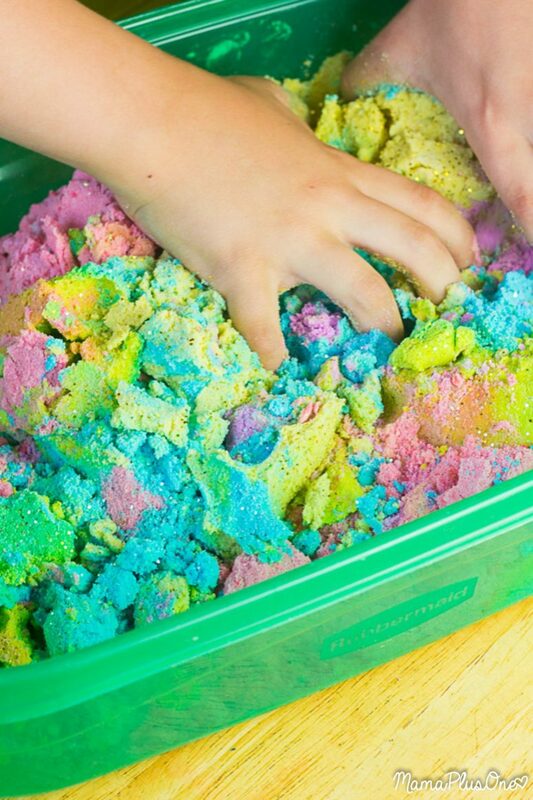 This sensory bin is filled with kinetic sand and with some construction toys, which makes a cool and fun activity for children. The sand itself is blue and green, and kids love bright colors a lot. 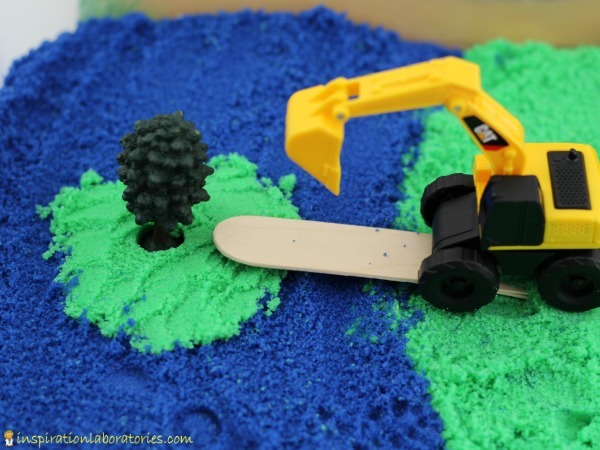 Your children will love cooping, digging, and moving the sand all around, let them have fun! Usual kinetic sand you may buy is nontoxic, still it’s not considered edible and neither is this kinetic sand recipe. Kids should always be supervised or old enough to know not to put their fingers in their mouths when working with soaps and starches. 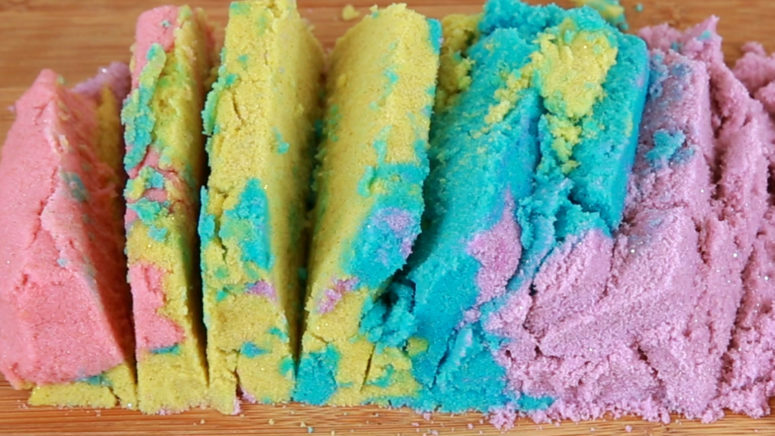 This recipe will tell you how to make super colorful and more or less safe kinetic sand using cornstarch and food coloring. Go for it and let your kids have super fun! Here’s a fun sensory activity that will happily occupy the kids for hours: It’s oozy, maleable, and uses household ingredients. 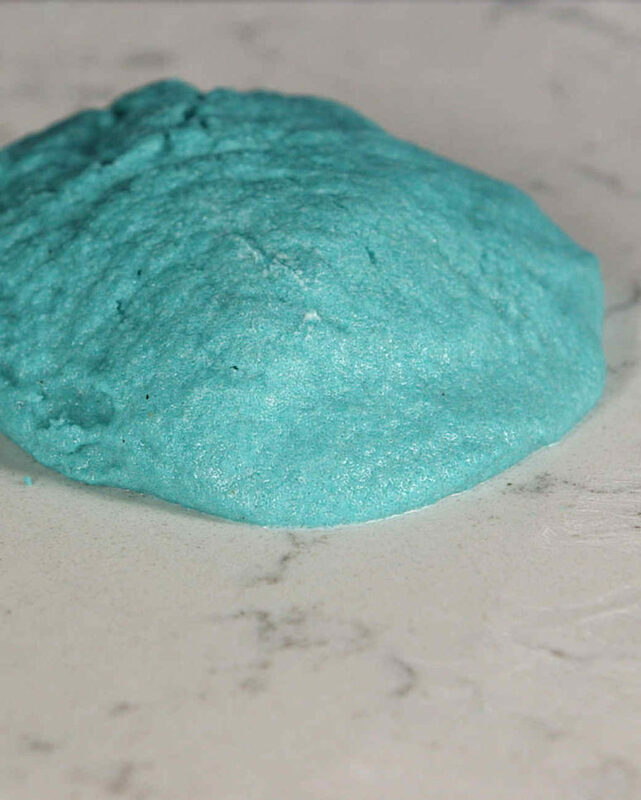 Cornstarch gives the mixture pliability, water makes it ooze, and choosing your own sand allows you to mix and match in any bright color of the rainbow, here it’s turquoise to remind of the beach holidays but you may try any bright shade your kids love. 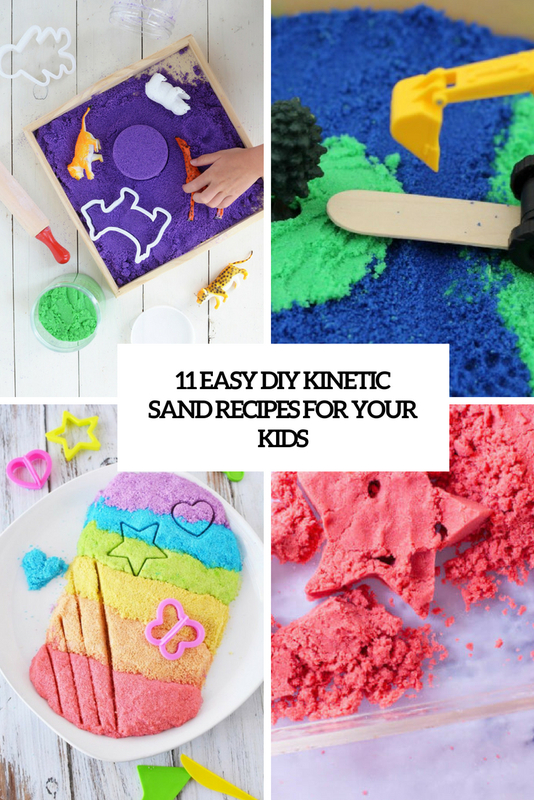 Kinetic sand is one of the easiest sensory toy, and sensory play activities are always perfect for kids, and they’ll love making it as much as they’ll love playing with it. But adults can also have fun and get relaxed with it, so make some for your kids and for yourself, too. Besides the sand, you probably have everything you need to make this in your kitchen already: water, cornstarch, dish soap, and food coloring. Go for all the colors of rainbow! 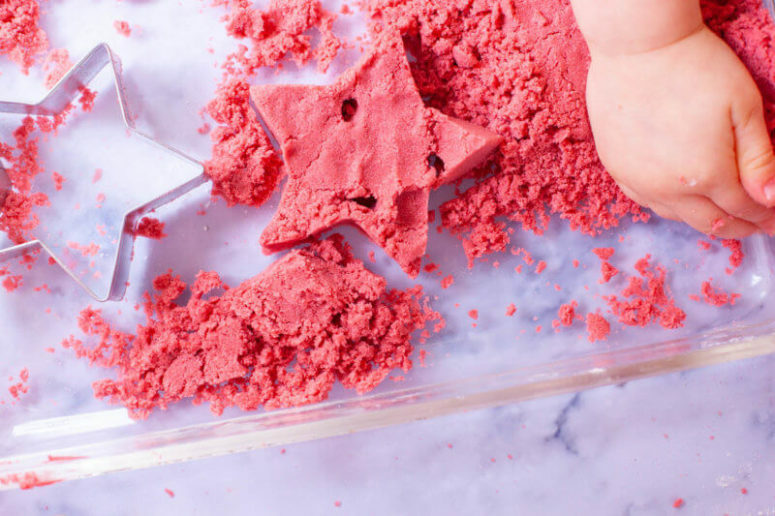 This kinetic sand recipe uses just 3 ingredients to make a soft, moldable sand that provides hours of sensory play time. 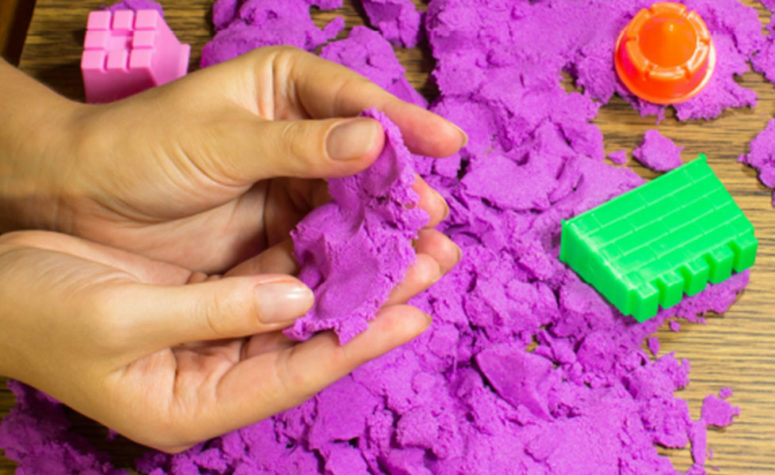 This makes kinetic sand a lot of fun for kids to dig in like a sandbox, but they can also press it in their hands, cookie cutters, or other containers like candy molds. The recipe includes only colorful sand, cornstarch (or flour), and oil. Read the tutorial to find out in what proportions to mix them. 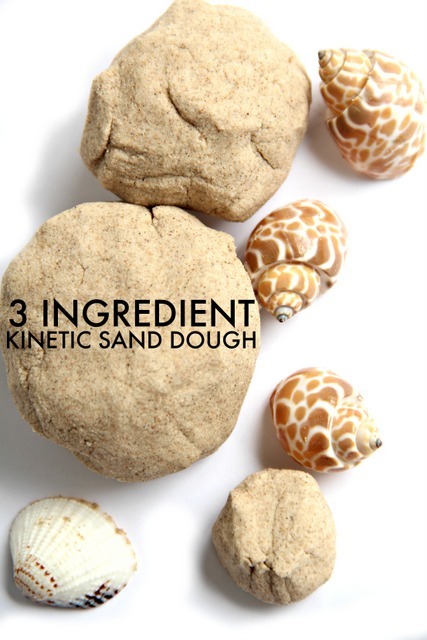 This kinetic sand recipe is very unusual as it includes shaving cream and baking soda! The result is something closer to slime, the sand is super moldable and very cool. 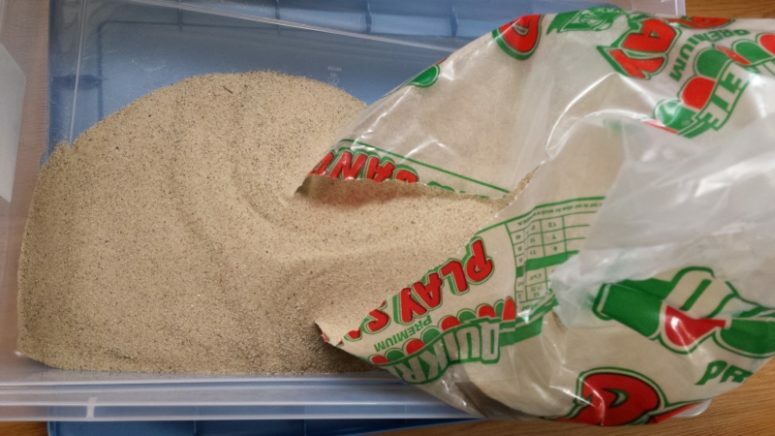 Read how to make it and enjoy various activities stated in the recipe to play with this sand. The real Kinetic Sand is made using dimethicone: a man-made silicone oil commonly found in cosmetics. The dimethicone is what gives the sand the ability to stick to itself, making it a much cleaner toy than regular sand. This version uses cornflour, water and dishwashing liquid to create the goopy consistency that bonds the sand. It will not feel exactly the same as the real Kinetic Sand and it is not entirely mess free, keep it in mind. Do your kids love the beach? Why not make them their very own beach sand to play with. You can get creative with color and it will keep the kids entertained. Even when the beach season is over, it’s no problem, your kid swill be able to play with this sand in any season and anytime. Unicorns are fun and colorful, and if your children like them, too, this kinetic sand is exactly what they will love! 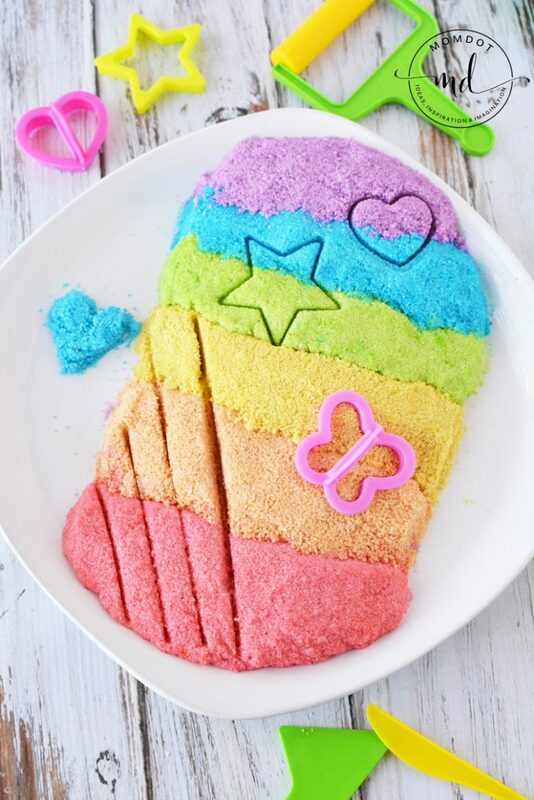 This kinetic sand is made in all the colors of rainbow and there’s much glitter added to make it more sparkling and bright. If you want to keep the colors brighter longer, simply store each color separately and play with it separately. The nice thing about this kinetic sand, is that it doesn’t fly everywhere, and get in eyes. The recipe includes cornstarch, water and essential oils. Add tea tree essential oil to the water, or use a 10% bleach solution or 10% vinegar solution this will prevent any smell or mold. Read further instructions in the source.